When I was a little girl, I saw God as a big white man with a flowing beard, like Moses. But, as I got older, that image didn’t work for me anymore. For awhile I tried to just not think about it, as the subject made me uncomfortable. But part of me yearned for an image that reflected God to me. Since my religious heritage is Christian, I could attach the tradtional image of Jesus as that of the visible face of God. But, to me, the physical face of Jesus seemed to be only a partial view of God, only one of God’s faces. I’ve always delighted in seeing faces in the things around me, like in clouds and in the grain of wood and hiding in the crevices of stones. I realize that’s probably because I, as a human being, am trying to see my own species reflected in everything I see. But it surely is fun. On the other hand, if God is an unanswerable question, an infinite mystery, the source of all being, then it must also be true that the creative force, the essence, or face, of God, can show up in unexpected places and be incorporated into everything that is. Perhaps, if we look closely, with the spiritual eyes of knowing, we’ll “see” God in everything around us, including me, and you. With that premise, I’ve been collecting pictures of the face of God. Sounds strange, doesn’t it? But these pictures illicit in me a reverence and awe that reflects my view of the majesty and mystery of God. This first offering is titled Graceful Vines. Or grace-full vines. I’ve always liked questions. To me, answers never seemed quite satisfying, and they were never set in stone. I was always peeking under dogmas and looking skeptically at rules and rethinking decisions. Though I was quiet in my rebellion, I always had to have a solid reason to go along with what others said was true. So, when I tried to put myself into a who-I-am box, I was troubled at the inconsistencies that kept popping to the surface. Now, finally, I’m making a stand. On a line. I’m going to walk along a crooked line. No box for me. I think, at least for now (no rules, remember? ), it works to be riding that line between whimsical and serious, earthy and in the clouds, teacher and student, childlike and wise. To illustrate this point to myself (for isn’t that why we really write, for ourselves? ), I chose two photos from my file, Sweet Fairies and The Moment of Choice. As I look at these photos, they seem pretty opposite to me. The casual viewer might not know that one artist created both of them. Yet I did. Yes, they were created at very different times in my life, but both still hold personal meaning for me. 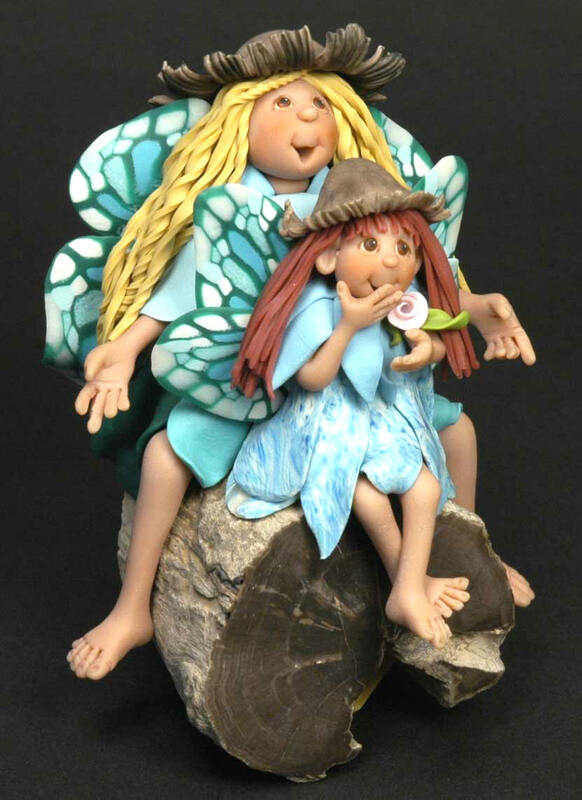 The little fairies were created around 1990, and were purchased at the Minnesota Renasissance Festival by my mother, AnaBel Peck. When she died in 2005, I inherited them, and I was particularly happy to have them back, as I had always loved them. Why? I love their spirit. I love that they are alive with joy. I love that they give a glimpse into an unseen world of imagination and play. I love that my mother loved them! And I love that they still make me laugh. And the framed piece? I made that one in 2007. I love that it reflects my serious side. 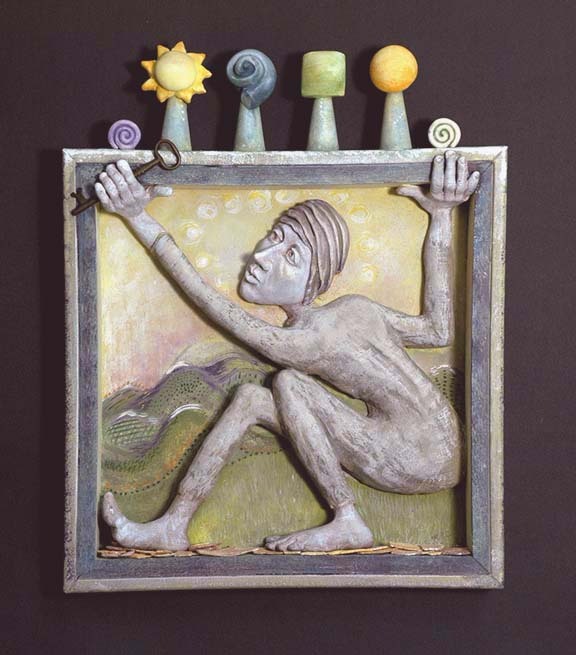 It talks to me about stretching my artistic skills and about choosing to make a direct spiritual statement through my work. Recently I read the book Eat, Pray, Love, by Elizabeth Gilbert. I really enjoyed reading about her determination and resulting struggle to ride that line between seemingly conflicting values. Eat or pray? Love or pray? Love and pray? Pray then love? Eat then love? Love and love? Body and pleasure or spirit and godliness? Her life would have been easier if she would have chosen one harmonious, simple way of being, but it wasn’t her. On page 29 she talks about “the great Sufi poet and philosopher Rumi once advising his students to write down the three things they most wanted in life. If any item on the list clashed with any other item, he advised, then you are destined for unhappiness. Better to live a life of single-pointed focus, he taught.” Elizabeth balked at that premise, and set out to explore how she might live harmoniously amid extremes. And she did find success – or at least a riveting story to tell. I’m not about to set out for Italy or India, nor settle into paradise amidst the aromas of intoxicating Indonesia, but I am willing to accept that I have the right, and the need, to walk along a line that threads its way between varying degrees of opposites. To help guide my way, I’ve chosen three things as what I most want in life, and by these I’ll measure what I choose to do in 2008. The three corners of my triangular guide are (1) the awareness and experience of the mysteries of spirit, (2) connections with people, and (3) immersion in the creative process. I don’t think there are any conflicts there, in principle, but there will be some hard choices. And, I think, much more clarity as I walk my path.